Just read on Crunch Gear that Samsung is showing off their WiBRO Mobile Phone. But the one which everyone talking about (and has being waiting for since June) is the one below: Samsung SPH-P9000. 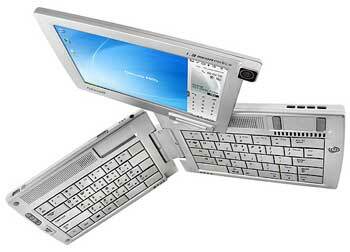 It is really more of a PDA with a fold-out keyboard. Beside the interesting form-factor, it support EV-DO as well as WiBRO* (Tech Spec). * These days, when Samsung talks about WiBRO, it is not certain if they are referring to Korea WiBRO or the (going to be) harmonized WiBRO with Mobile WiMAX. This entry was posted on Friday, November 10th, 2006 at 9:54 am and is filed under Toys and Gadgets. You can follow any responses to this entry through the RSS 2.0 feed. Responses are currently closed, but you can trackback from your own site.